Try our very easy appetizer recipe. 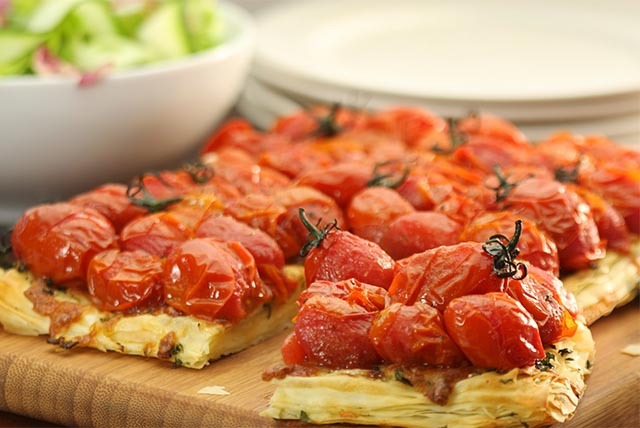 Start with puff pastry and top with cherry tomatoes and a medley of cheese. This appetizer recipe is sure to be a hit at your next get together. Place puff pastry on parchment lined baking sheet. With a very sharp knife, score pastry all along sides, about 1/2-inch, to make a small border. Inside border, poke pastry all over with a fork. Meanwhile, place cherry tomatoes in large bowl and toss with dressing and pepper. Spread mustard over the pastry. Sprinkle with cheese and top with tomatoes. Bake 15 to 20 min. or until golden brown. Let stand 5 min; cut into squares. Sprinkle with 2 Tbsp. chopped fresh basil after baking.